A trip to the Museum of Tropical Queensland is an exciting experience of inquiry and discovery for all ages. Please book as early as possible and simply complete our School Inquiry Form. 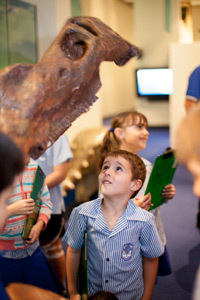 All levels of schooling from kindergarten to Year 12 are encouraged to visit the museum. All led programs and activities are developmentally appropriate, structured and conducted by our qualified Learning Officer and are complimentary to the current Australian Curriculum. Read Planning Your School Visit to ensure you have a smooth and enjoyable experience. Use our Loans service to view available kits, specimens and artefacts. We welcome bookings from groups and special admission rates apply for groups of 10 or more. Prices start at just $12* per adult. The Museum can also arrange light refreshments via the Museum café for a small additional cost. Local Vacation and Outside School Hours Care groups may also take advantage of the $4.40 per child entry price. Vacation care groups have the opportunity to visit and participate in a wide range of activities during school holidays. Please see the Museum's event calendar for the upcoming exhibitions and school holiday programs. Teachers and support parents are admitted free at a ratio of 1:5. Have your birthday party at the Museum! Children’s Birthday Parties include a decorated table, party hats, hot party food, juice and an ice-cream cone. Visit our Museum Birthday Parties page for more information.